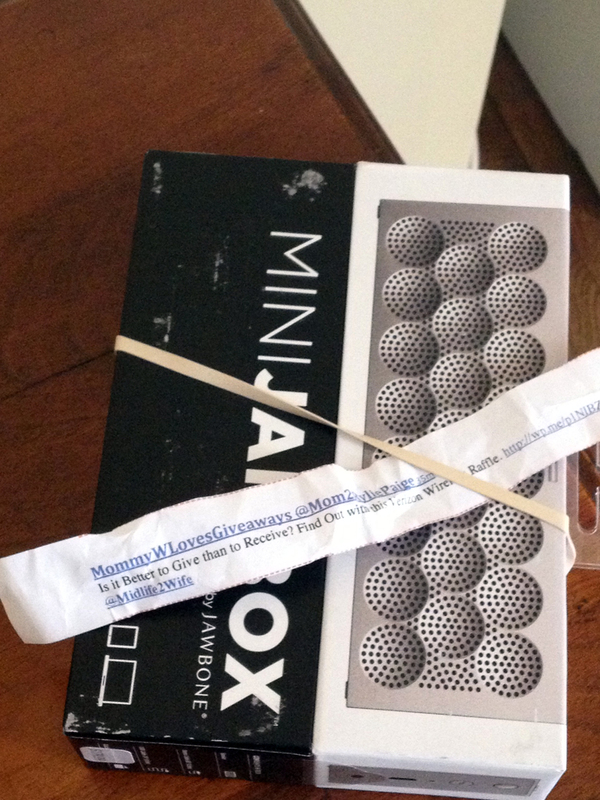 Posted by themidlifesecondwife in Giveaways, Product Reviews, Technology, What's the Buzz? I held the drawing this afternoon to select the winners of three amazing devices from Verizon Wireless. Because I suspect you all love suspense as much as I do, I’m going to announce the prizewinners individually over the next day or so. Congratulations, Shawna! Your prize will be shipped to you soon, along with a few other goodies from Verizon Wireless and yours truly. Thanks so much for entering! Check back later for news about the other two winners! One of my favorite books when I was just learning to read was Joan Walsh Anglund’s beautifully illustrated Christmas is a Time of Giving. I also loved O. Henry’s short story The Gift of the Magi. I’m sure that the sentiments expressed in those pages set me up for a lifetime of loving to give presents. This holiday season, I’m honored to have a little help from Verizon Wireless as I put on my Santa suit. 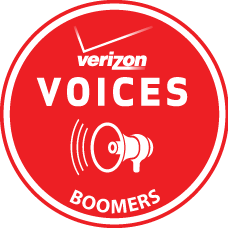 My time as a member of the Verizon Boomer Voices program is drawing to a close. To celebrate a collegial and successful partnership, and to thank you for following my adventures in technology, I’m giving you a special holiday present: the chance to win one of three phenomenal mobile devices, courtesy of Verizon Wireless. Without further ado, here is the first item offered through my raffle: The Verizon Wireless Ellipsis™ 7, a portable full-feature tablet available exclusively by Verizon and its fast 4G LTE network. • It allows you to seamlessly balance your personal and professional life. Read emails, download documents and files, manage calendars, and sync your contacts easily so you can stay productive on your next adventure. • It enables you to share photos, videos, contacts. • It helps you stay connected with the enriched features of Verizon Messages. The MiniJambox by Jawbone brings beautiful, wireless sound to any experience via Bluetooth or a 3.5 millimeter stereo cable. Completely portable, it’s small enough to fit into a pocket or a clutch purse. In fact, it rather looks like a clutch purse, doesn’t it? The MiniJambox comes with up to 10 hours of built-in rechargeable battery life. You can customize and personalize it with the Jawbone app. A built-in speakerphone even lets you take calls on the go. Finally, here for your raffling pleasure is the Mophie Juice Pack Powerstation. With a quick-charging 4,000 mAh external battery, this handy device was designed to provide rapid charging. The Powerstation can switch between 500 mA, 1 amp, or 2.1 amps, giving you high-output power for just about any USB-charged device. Its compact, lightweight design makes it easy to carry, and it works with a range of devices—smartphones, tablets, and portable gaming systems. Leave a relevant comment on this post, tweet about this giveaway (if you follow me on Twitter, retweeting this post will count as an entry! ), or leave a comment on the Midlife Second Wife’s Facebook page. If you tweet or retweet, be sure my Twitter handle is included: @midlife2wife. That way I’ll be sure to see your activity. The more comments and tweets the better, so by all means feel free to leave more than one. The deadline to enter is 12 o’clock noon (Eastern Time) on Wednesday, December 18, 2013. I will have Colin, my intern, select product winners from the different platforms on the afternoon of December 18. You have just one week to fill my inbox with comments, tweets, and Facebook notes! One prize per person and three prizes to be given away, along with a few extra swag-bag goodies for each winner. For shipping purposes, I must have a U.S. address to send the items. I’ll announce the winners here on the blog. Thanks again for reading, for following, and for entering the raffle. May you be one of the lucky winners! Posted by themidlifesecondwife in Midpoints, The Writing Life, What's the Buzz? Had fashions in the late 1960s been otherwise, I would not have the strength of character that I possess today. 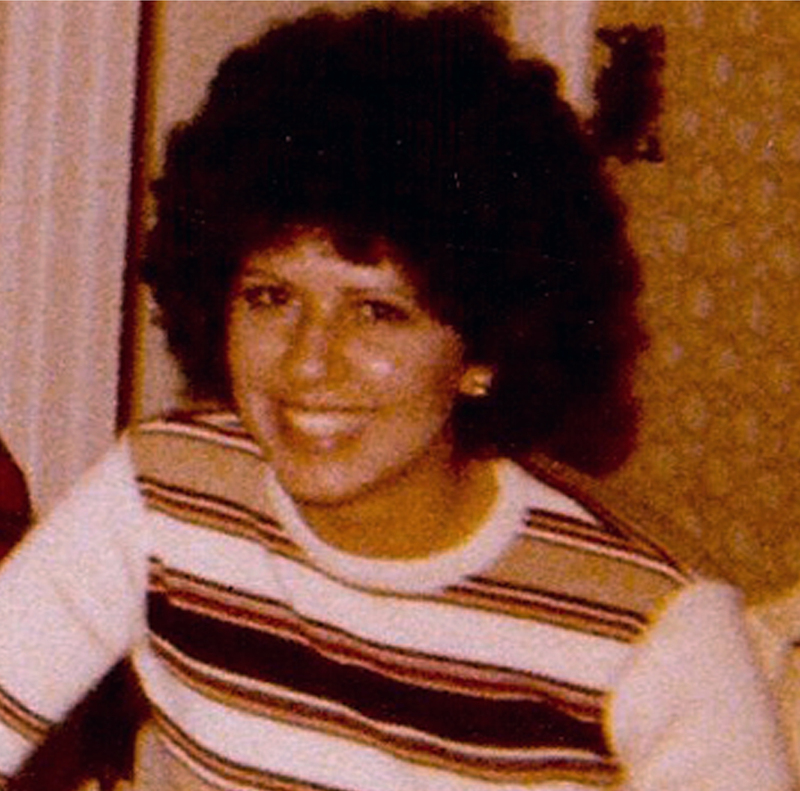 I was born with complicated hair—thick, unmanageable, impossibly curly hair. And not the good kind of curly, either—the Andie McDowell/Julianna Margulies-kind of curly—just coarse and wiry and frizzy hair. This frizzled look would be en vogue today, when stylists spend considerable time crafting the look for runway models—a look that used to send me reeling in horror from the bathroom mirror. No, mine was the era of Carnaby Street, Twiggy, and the Summer of Love, and I had complicated hair. The fashion at the time was either cropped short, like the iconic pixie cut Vidal Sassoon created for Mia Farrow in Rosemary’s Baby, or long, sleek, and straight, like Jean Shrimpton or Julie Christie—all blondes, I might add. Relief came for a little dark-haired girl in the form of a beautiful brunette named Marlo Thomas, who, in the landmark television series That Girl, wore her straight glossy hair in a flip with bangs. The fact that Marlo was Italian and Lebanese, just like me, and had a father with whom I’d been photographed earlier in the decade, clinched the deal. She—that girl!—would be my role model. God knows, I needed one. I had complicated hair. That’s my godmother, “Aunt Fannie,” speaking. It’s 1968, and I’m in the seventh grade at St. Mary’s School in Elyria, Ohio. We’re having our class pictures taken in a few days, and my parents have driven me to her house to have my hair done. Aunt Fannie was a licensed beautician. (That’s what they called hair stylists in those days.) My godfather, Uncle Bill, was a gifted carpenter, and although he was not a professional contractor, he built their lovely ranch home in a rural part of Elyria from the ground up, and turned one of their basement rooms into a hair salon for my godmother. My father drove my mother there to have her hair done each week, and I was always in tow. 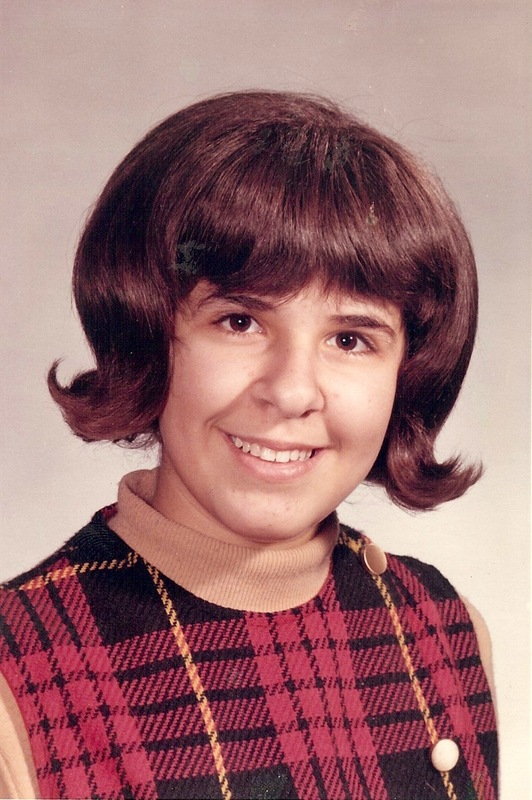 With school-picture day looming, I begged and pleaded with my parents to let Aunt Fannie cut my hair so that I would have bangs and a flip, just like That Girl. I finally wore them down. It wasn’t long before I was seated in the chair that swiveled around like a carnival ride. Aunt Fannie’s fingers wielded the silver scissors like some magician’s wand—snip! snip! snip! I had been turned away from the mirror the entire time, and couldn’t wait to see my idol’s impeccable hairdo in place of my tangled Medusa mane. When she spun me around, I was shocked. None of us had really taken my thick frizz into account when calibrating the outcome of my longed-for flip hairdo with bangs. 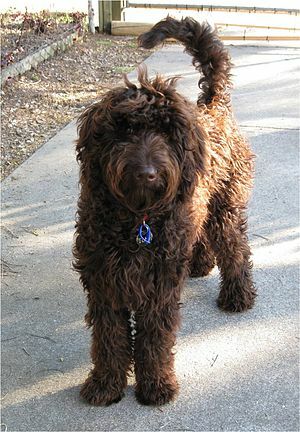 The flip flopped, and I looked like a Labradoodle. I hesitate to say this, because you’ll think that I spent my entire childhood in tears, but I have to tell you that I cried. Not a full-throated cry—just a whimper, with a steady stream running down my cheeks. “Isn’t–isn’t there anything you can do?” I asked my godmother, sniffling. Flat irons had not yet been invented. She thought a moment, then brightened. “I can’t go around looking like this, Daddy.” I thought he should know where I stood on the matter. The tension in the air was palpable. My parents exchanged words. Aunt Fannie busied herself by rearranging her hair clip drawer. I escaped upstairs to soothe my nerves with a tall glass of 7-Up. When I came back down, the charged atmosphere had eased. I’ll never know who convinced him—my mother or Aunt Fannie—but my father had backed down. Aunt Fannie was mixing the chemicals that would solve the crisis and turn me into “That Girl” for my school pictures. “You have to suffer to be beautiful,” she replied sagely. I don’t remember how long I sat in that chair. It seemed like months. But I finally was directed to the shampoo bowl, and felt the cool relief of water soothe away the stinging, rotten-egg smell of the straightener. Aunt Fannie washed and conditioned my hair and combed it through. I was entranced! When I touched it, it felt smooth and sleek; I had never experienced such a sensation in relation to my own hair before. My head looked smaller, too. It wasn’t my hair anymore; it wasn’t me. It was better. New and improved, as the commercials used to say. Aunt Fannie set my hair in rollers and sat me under the dryer, where I perused the latest movie magazines. When I was dry—cheeks red and hot from the heated air, rolled hair crisp to the touch—Aunt Fannie set me back in the swivel chair, where she began unpinning the rollers, vigorously brushing out my new hair. It gleamed. It shined. I had never seen anything like it. She sprayed hairspray all over me—the air was thick with it. I sneezed and coughed. But I looked beautiful. You have to suffer to be beautiful. And you are! Look at that girl!